I felt so embraced with comfort almost immediately after I entered the gate leading to Sheraton Senggigi Beach Resort. After a gruelling hike up the Mount Rinjani and sleeping in tents for 2 nights, Sheraton was definitely a great choice that I didn’t regret as I know I will have an awesome stay in this beautiful resort. 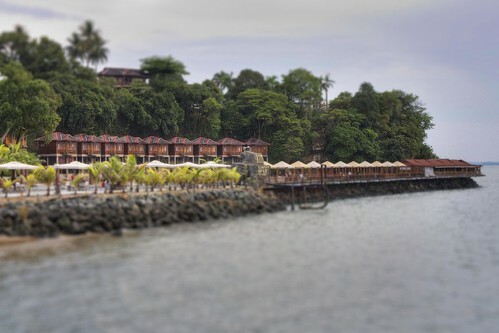 I cannot emphasize enough how delighted I was to end my hike and head to Sheraton Senggigi Beach Resort to have myself cleaned up and have a good rest! 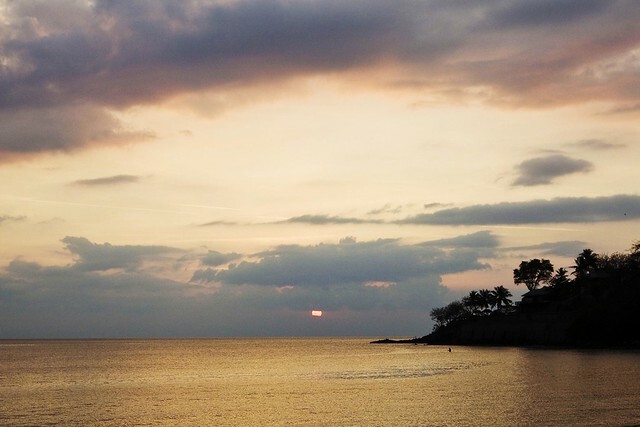 To end off this post, I would love to share a photo that I took during my stay in the resort. I didn’t know that the sunset view from Sheraton Senggigi Beach Resort can be so mesmerizing. I felt a hint of satisfaction when I caught a last glimpse of the Rinjani’s crater when I finally reached the tip of the crater before descending down with 7 more hours to civilization. The view was so picturesque that I chose to take a break and took a shot of it. It was also a significant sign that I am finishing my hike in Mount Rinjani very soon! The hike was really tough and I’m really glad that I have pushed myself through the hike with unbearable pain and aching all over my body which I’m looking forward to pampering with massages after I got back to civilization. Hot shower, good massage and soft comforting bed were all the motivations I need to use every ounce of my muscles to keep moving on. 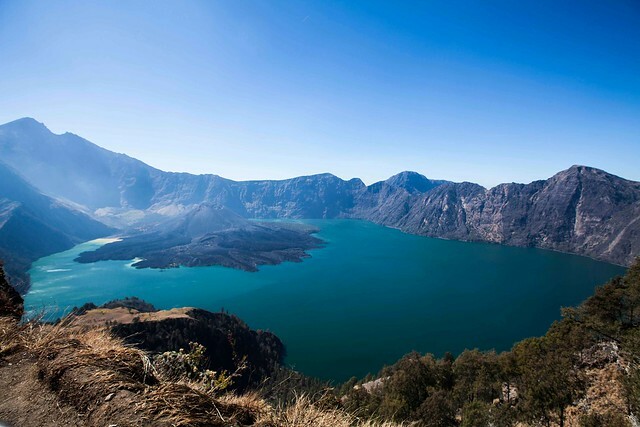 In this post, I want to share the gorgeous view of Rinjani’s crater that is still very vivid in my memory. I put all my effort into this hike and this view is definitely a very rewarding for me. 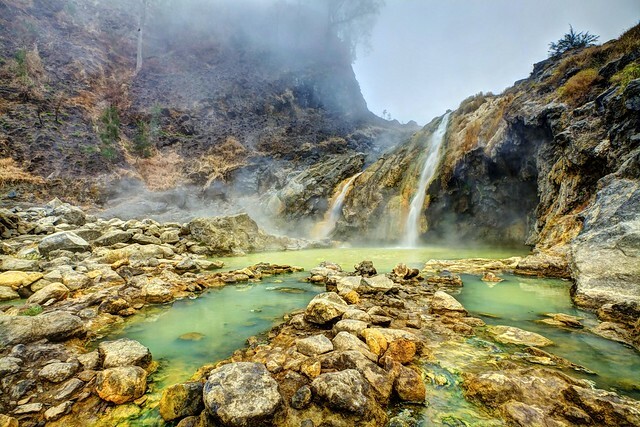 The only thing that spurred me on was the hot spring that was promised to be take away all our tiredness and aching from our body. I pushed myself to hike down from the base camp to the lake where we will be spending the night before we have to spend the whole day hiking up the crater before descending again to civilization. The volcanic ash was so fine that I can see them filling up my pores, literally! I was getting a little desperate for a good wash in the hot spring when I saw the lake from the top of the slope that I let the gravity do it work and let myself run down the path despite the fact that my legs were getting sore! As soon as we saw the hot spring, I was so glad that I brought my camera along to capture the scene I have been longing so much to look forward to after getting deprived of a good wash after hiking for 2 days. This picture was captured with 16-35mm F2.8 L on 5D II with a single RAW file and later separating them into 5 different exposures for merging them into HDR in photomatix. For someone who’s untrained and with a body not conditioned to hike on the treacherous terrain of Mount Rinjani in Lombok, Indonesia, I was already very much contented that I managed to reach the base camp! It was definitely a short and tough hike which will last us for another two days and we were supposed to try our very best to hike to the peak of Mount Rinjani from the base camp starting the next morning in the wee hours at 3am. I was filled with anxiety that I can’t go to sleep without first setting up my tripod for long exposure night shots. As the sky started clearing of the clouds, the Milky Way started presenting itself and I was just sitting there enjoying the view! The feeling is very much like I’m seated in a cinema theater watching the screen unveiling itself to give me a good show! After I enjoyed my share of the beauty in the sky, I started setting up my tripod to take home my “trophy”. 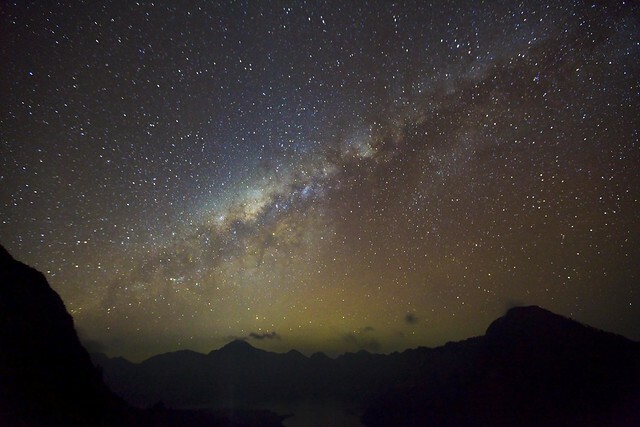 Well, my energy was never drained like this before just to get to the base camp in Mount Rinjani and this is my maiden visit, so the pictures of the stars in the night will be my best gift for all my effort. I took this with my 16-35mm f2.8L on my 5D II using shutter speed of 30 seconds long and wide open at f-stop of 2.8. That was the very first time I stepped into the Lombok International Airport and I was already anticipating the island will offer me a stay with a more quiet side of Bali. Several sources of media have already etched an impression in me that Lombok is very much similar to Bali. However, Lombok is not as commercialized as Bali. Most of the passengers in the same flight with me were not tourists so that has already implied to me that I can expect Lombok to be a very laid back and peaceful island where you won’t see so much of nightlife or beaches full of tourists. On our way to our guesthouse to stay for the night, we were driven past a great picturesque viewing point in Senggigi beach area where I got my first shot in Lombok. 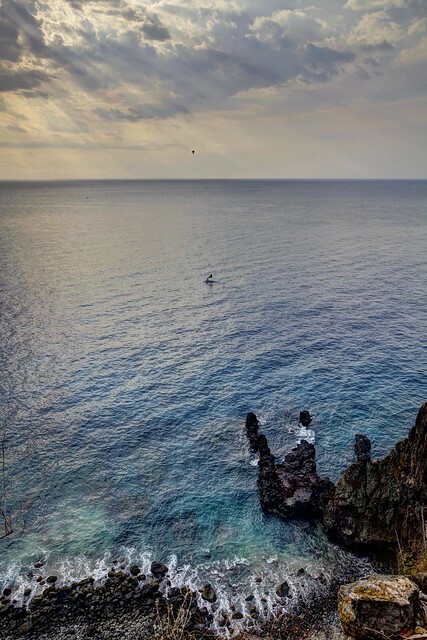 This high vantage point where we were dropped off for a short break offered us an awesome view of the sea and the horizon. I took this picture with my 5D II and 16-35mm f2.8L and this HDR shot is made up of 5 different exposures separated from a single RAW file. I used photomatix to merged them into a HDR. A visit to Bali, Indonesia was made for my very first leisure overseas trip by flight. I remember vividly that it was on a valentine’s day when we flew. Bali is the place where I had my first culture shock and the great feeling of touring around was overwhelming! The main religion there is Hinduism and the locals there converse in malay language! A typical stereotyping in Singapore would be that someone who speaks mandarin would believe in Buddhism, Christianity or free thinker, someone who speaks tamil language would believe in Hinduism and someone who speaks malay language would be a muslim. But in Bali, locals speaks malay language and look like a malay but believes in Hinduism. Back then, it was really different from what I usually see in Singapore. That is what I call eye-opener! We stayed in Mercure hotel in Kuta beach area where the beach is just a single lane road across! 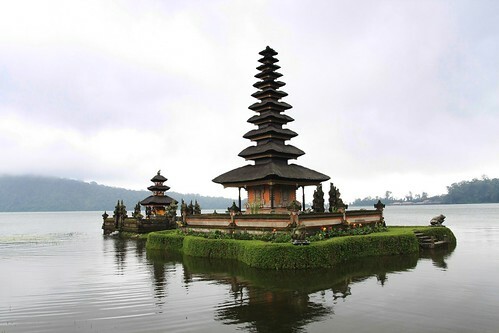 After negotiating with the driver, we have gotten a good price for a day tour around few scenic sights in Bali. You can find drivers for hire with their vehicles in Bali anywhere around all hotels. There is a particular place where we wished to visit but do not know exactly the name is. 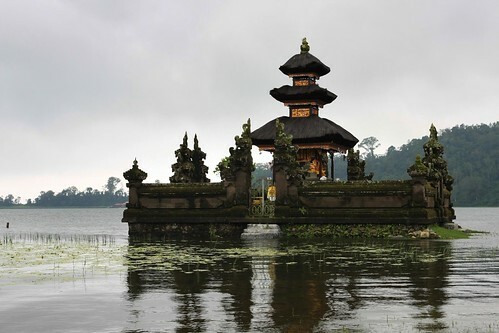 Then, we got to know that this is actually a temple area and is called Ulun Danu temple. In fact, we got to know this temple through the rupiah currency! You can find the picture of this temple in their rupiah notes. What we did was to show the note to the driver and he quickly knew where we were referring to. When we were finally there, there was a hindu ritual going on in the temple. So we roamed around the out skirt of the temple. The temple that is shown in the photo below is actually submerged in the water, later then we found out that the temple is only partially submerged in water during high tide. When it is low tide, you can actually walk across to it! The photo is taken with my 40D with TAMRON 17-50mm f2.8 for my very first virgin shoot overseas. Finally came across these photos which I almost thought I have never taken before. That is one good thing about starting the blog here and start sharing the photos that I did. It somehow keeps me going as there is a motive now for me to grab nice shots. The photos which I would about to share here is on Batam KTM resort which we visited. This resort is really nothing to shout about, literally. It doesn’t have a decent beach for us to lay our feet on. You will know the reason why later when you see the shot. There are no shopping centers around the vicinity. You have to get a transport to the nearest shopping centers if you like to shop. The swimming pool is somewhere I don’t want to be in. The water is milky and sandy! It somehow looks like no maintenance was done for weeks! 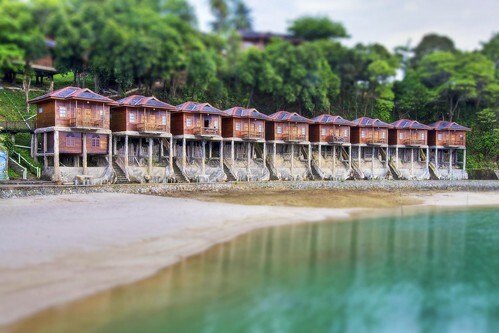 The price for the resort stay caters for those who are on budget but just want a short getaway from Singapore. You can choose this resort if you want to hold a gathering here and laze around. Well, at least I still could grab some shots there, nothing much really. After some tweaking around in photoshop, I decided to change the photos into miniature effects. I am using 16-35mm f2.8 L USM on my 40D. Yes! TAMRON 17-50mm f2.8 is a past! I see the need to upgrade the lens as I would foresee myself upgrading into full frame. So I was like preparing my lens for the great body change one day! The shore is on the rocks so there is no way you can go down to any beach, there is no beach. They were all fenced off anyway. Yet another miniature effects done by using Photoshop. Tilt shift lens are still considered foreign to me unless I really need it, otherwise I would rather spend the money on other lens that I would need! Not something I want.